Prep Day: Place 2 cups of milk in a microwave safe bowl. Place a disposable chopstick or microwavable kitchen tool in the milk and cook it just until it boils, about 4-5 minutes on medium power. Combine 6 tablespoons of the sugar, salt and butter in a large bowl. Pour the hot milk over it and let it cool until it reaches 110° to 115° F.
While the milk mixture is cooling, use a small bowl to whisk together the egg and yeast. Set aside. Once cooled, add yeast mixture to the milk mixture and mix well. Add the flour one cup at a time and mix until the dough is soft. Pour the dough on a well-floured counter and knead until it is very smooth and elastic; about 5 minutes. Place the dough in a large, well-greased bowl or dough-rising bucket. Cover with plastic wrap and let it rise until doubled, about 1 hour. Use a small bowl to whisk together the cinnamon and remaining 1 cup of sugar. When it has doubled in size, punch down the dough and pour it onto a well floured counter. Grease two 9-inch round cake pans with non-stick cooking spray or butter. Set aside. Use a rolling pin to roll the dough into a 10 X 14-inch rectangle. Brush the dough with 1/4 melted butter. Sprinkle the cinnamon-sugar mixture over the melted butter. Spread evenly across the dough. Starting with the long side closest to you, roll up the dough. Pinch the seam between thumb and forefingers to create a good seal which prevents the dough from unwinding. Use a serrated knife to cut the dough into 2-inch thick discs. Place the discs on the prepared pan with about 1 1/2-inches between the discs. Tightly wrap the pan with plastic wrap and tuck in the freezer for up to 4 weeks. Serve Day: The evening before you want to bake, remove frozen cinnamon rolls from the freezer and place the pan in the refrigerator overnight. On the day you want to bake, remove pan from the refrigerator and let it rest on the counter for 20 minutes. Preheat oven to 350° F.
Bake for 25 minutes or until golden brown. Let the finished rolls cool for about 5 minutes. While the rolls are cooling, mix together the glaze. Combine powdered sugar and 3 tablespoons of milk in a small bowl. 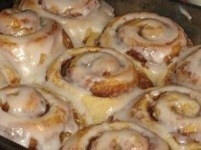 Drizzle the glaze over the cinnamon rolls and serve warm.